Let’s face it: The fear of clowns is nothing new. There’s something sinister about a jolly fat man dancing around in a red nose, some old face paint, and big, oversized shoes…not to mention the fact that they’re obviously insane, what with their car-packing and balloon animal antics. And don’t even get us started on mimes…they don’t get the same scary rap that most clowns get, but they should: A clown that forces you to watch his every move because he refuses to talk? Excuse us, but we happen to find that completely horrifying. Also, totally rude. 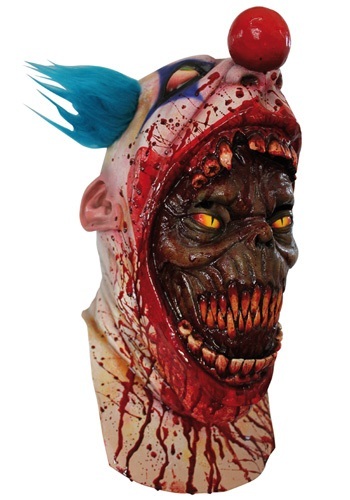 So really, all that this Coulrophobia Clown Mask is doing is just confirming what everyone already knows: Every single clown in the entire existence of the world is possessed by demons! And who doesn't love having their deepest fears and greatest suspicions confirmed?! Basically, wearing this mask is going to be doing the world a favor...you'll be educating people, as well as edifying them. And yeah, you'll also be horrifying them out of their minds, but in a goodway! Take that, CLOWNS!